Would you like to help deserving students receive the aid they need for academic programs? For the Love…of Learning, on February 20, 2016, as well as volunteers. The annual benefit is held to raise scholarship funds for deserving students enrolled in LRC programs. You can help by becoming a sponsor, donating auction items or becoming a volunteer. We offer five levels of sponsorships, from $500-$7,500, that include benefits such as recognition and acknowledgement. For more on sponsorship levels and benefits, please visit lrcpolk.com/the-learning-resource-center-is-looking-for-love-in-february/. Do you have an item that you can donate to be auctioned at the event? Find ideas in the bulleted list below, but don’t let this list deter you from donating if you have an item that you don’t see on the list. Donated items will be auctioned off for the same worthy cause as sponsorships, to create scholarships for deserving students. If you are looking to volunteer or are in need of community service hours, this is the opportunity for you! We could use special event assistants to help with both preparing and running the event. Please contact Pamela Craven for further details on what volunteering will entail. If you will be attending For the Love of…Learning 2016, please help spread the word by joining our Facebook event page. We hope to see you there and appreciate all that you do to support LRC! The Learning Resource Center of Polk County, Inc. welcomes new board member Annie Sullivan. Sullivan brings both broad background knowledge of the people and communities of Polk County and the professional business experience of a Certified Public Accountant along with extensive civic participation with the Junior League of Greater Lakeland. Vice President and Controller at Farm Credit of Central Florida, wife, mother and LRC board member are all titles that Sullivan now holds. LRC is thrilled to work with Sullivan as well as the five new members added to the Board in fall of 2015. School is out, and winter break is here! Don’t let boredom get you (or your child down) this holiday season. Check out these ideas for students of all ages and levels. – Read your favorite book. – Write a letter to a friend. – Create a holiday craft. Bok Tower, The Orlando Eye, theme parks, shows, movies, ice skating, etc. – Make a 2015 time capsule with memorable items from the year. In the month of November, Learning Resource Center students received 1,384 hours of tutoring, bringing the Year-To-Date Total to 4,534 hours (please note that the YTD total starts over in July). 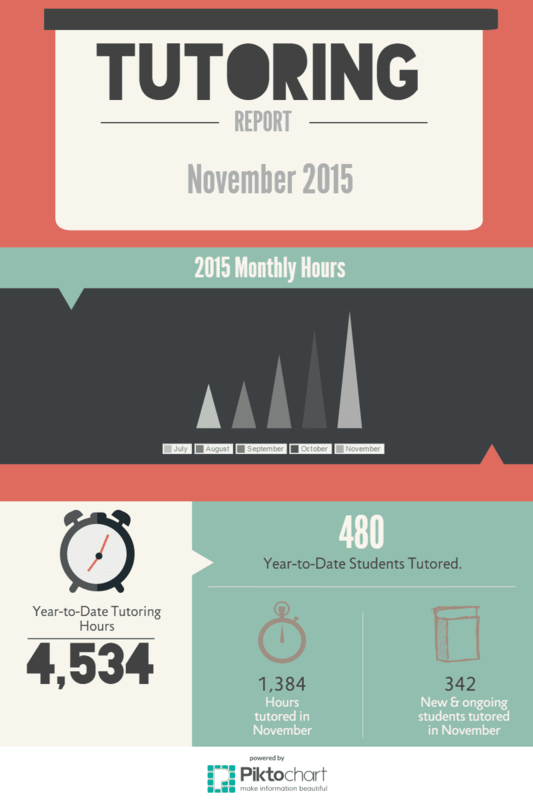 New and ongoing students tutored during the month of November equaled 342 students. The new year will soon be upon us! Take a look at the upcoming courses and dates we have planned for 2016, and get ahead by reserving your spot in attendance. You’ll find One-to-One Tutoring in a variety of subjects, test preparation, study skills, and college success planning below. Join us in 2016 in a program that fits your needs or the needs of your child. One-to-One Tutoring is designed to meet each student’s individual academic needs based upon his/her learning styles and ability levels. Tutoring Services include: One-to-one instruction with a highly qualified teacher; multi-sensory learning strategies geared toward individual learning styles; improvement of student’s academic achievement; enhancement of student’s self-esteem to improve school success; flexible schedules and locations; fee reduction based on family income. Where: Tutoring may take place at any of the following locations: LRC, public library, school (with permission from principal), local business, church, tutor’s home, etc. This course provides: small classes with highly-trained teachers; problem-solving strategies for analyzing and answering ACT questions; practice taking ACT tests; emphasis on test-taking techniques and strategies specific to the ACT that help build confidence and reduce test anxiety. When: Mondays and/or Wednesdays at 5:30-8:00 p.m. for four consecutive weeks (with the exception of school holidays); Writing (one Saturday only) 9:30 a.m.-12:30 p.m. Note: January’s course will take place on Tuesdays (Math/Science) and Thursdays (English/Reading). This course provides: small classes with highly-trained teachers; problem-solving strategies for analyzing and answering SAT questions; practice taking SAT tests; emphasis on test-taking techniques and strategies specific to the SAT that help build confidence and reduce test anxiety. When: Tuesdays and/or Thursdays at 5:30 p.m.-8:00 p.m. for four consecutive weeks; Saturday, Essay Writing (one Saturday only) 9:30 a.m.-12:30 p.m.
Study Habits of Successful Students provides study skills and motivational strategies to prepare students in grades 6-8 to become more effective learners. Students learn and practice time-tested, effective, and efficient study strategies. The course is designed to offer small classes with activity-oriented lessons to help students learn and practice these study habits of successful students. Listen Up and Take Notes! When: Five consecutive Mondays from 5:30 p.m.-7:30 p.m.
College Success Planning provides study skills and motivational strategies to prepare students in grades 9-12 to become more effective learners. Students learn and practice time-tested, effective, and efficient study strategies, as well as concrete techniques to get the competitive edge necessary for high school and college. The course offers small classes with activity-oriented lessons to help students learn and practice these study habits of successful students. When: Five consecutive Mondays from 5:30 p.m. – 7:30 p.m.
Stay tuned for more information on our elementary summer programs, Camp READY! and Super Summer Success, as well as all fall and winter dates for 2016. Are you looking for 2015 holiday events in Polk County this December? We’ve compiled a list of fun, holiday events throughout the county that the entire family can enjoy. Have your calendar ready to mark the events your interested in, and scroll through the list of events categorized by ongoing, library, city and county, college, local theater, and attraction events below. If you’re looking for 2016 events, please click here. Details: Decorated wreaths will be displayed in the History Center from Nov. 20 through Dec. 12 at this fifth annual event. This event promises to be fun and festive for both decorators and bidders alike. Wreaths with exceptional decorating themes will be recognized with the Santa’s Choice designation during the display period. For more information, contact the History Center at 863-534-4386. Details: Be sure to see the vintage Model A’s outside Pinewood Estate, meet historical characters from the 1930s, and catch a few surprise personalities from the past. Tuesdays throughout December. Included with general Gardens admission. Time: 6 p.m.- 8 p.m. Details: Light lovers can enjoy a magical experience with opportunities to “ooh” & “ahh” over gorgeous holiday displays, much good cheer, and creatively-decorated bikes (and cyclists). Tours cost $30 per person and are limited to 7 adults per group. Bring-your-own-bike is open to all. Reservations required. Details: Lights of Lakeland 2015 is the TENTH ANNUAL, free walk-thru Christmas experience that the whole family can enjoy! Experience an evening of excitement and wonder filled with your favorite holiday sights, smells and sounds. With over 500,000 lights on display, your family will be able to enjoy: The Grinch, Santa’s Workshop, a reindeer barn, pictures with Santa & Mrs. Claus, food trucks, the Sweet Shoppe, a Bethlehem experience with live animals, the General Store for children to Christmas shop on their own and photos with cartoon characters. Time: 10 a.m.-12 p.m. or 1 p.m.-3 p.m. Details: Decorations and holiday fun for kids of all ages. On December 21-23, children can choose to attend Santa’s Workshop at 10 a.m.-12 p.m. and/or Mrs. Claus’ Kitchen at 1 p.m.-3p.m. Details: Bring your chairs and blankets for Haines City’s Christmas-themed movie series in the park. Popcorn and drinks will be available for purchase. Details: Stop by the Bartow Public Library on Saturday, December 5 to meet with Santa Claus and share some milk and cookies to celebrate the holidays. Details: Wear your pajamas, and come join us for the movie, crafts, and hot chocolate. Details: Family fun with a special story-time and crafts. Details: Join the library for the Elf movie and Elf-themed snacks and fun. Details: Watch Christmas movies at the library during the week of Christmas. The lineup of movies includes Arthur Christmas (Tuesday), Polar Express (Wednesday) and Home Alone (Saturday). Details: Join the City of Auburndale in kicking off the holiday season with refreshments, entertainment, tree lighting, Christmas lights and more. Details: This free Polk County Parks and Recreation holiday family event will feature sweet treats, arts and crafts, coloring contest, and a family movie. Details: This free Polk County Parks and Recreation community holiday event is for the whole family. This event will feature sweet treats, a hot chocolate bar, games, arts and crafts, and a family movie. Details: Auburndale Parks and Recreation presents the annual breakfast with Santa event. Admission is $8. Details: The annual Breakfast with Santa and Mrs. Claus will be presented by the Zonta Club of Bartow and the Women’s Care Center. Santa and Mrs. Claus will be on hand to greet children. Free craft activities for children included with the pancake breakfast. Tickets are $7 and will be available at the door. Details: This fun-filled event appeals to all ages and features lights, activities, Santa, reindeer, snow slides, and entertainment including Sisaundra Lewis from season six of NBC’s The Voice. Details: Find free photos with Santa (2-4 p.m.). a candy cane corner, kids crafts, train rides, games, holiday music, Elves Cafe, handmade items, and more at this 27 year Winter Haven holiday tradition. Details: This free Polk County Parks and Recreation holiday event for the whole family. Families will enjoy sweet treats, arts and crafts, coloring contest, and a family movie. Details: Join Haines City Parks and Recreation at Egg City where Santa and Mrs. Claus will great the children and pose for pictures. Admission is included with the purchase of a meal. Bring your cameras. Details: Join the YMCA of West Central Florida for the annual FREE holiday event at the Fontaine Gills Family YMCA featuring professional pictures with Santa, bounce houses for toddlers and school-age children, cookie decorating, crafts and more. Details: Winterfest festivities will include a visit from Santa and Mrs. Claus, electric night time parade, cookie decorating, lighting of Lake Play Park, and a cruise-in with classic cars, vendors and SNOW. Classic Car Cruise In – 4-8 p.m.
Visit Santa and Mrs. Claus – 4:30 p.m. Lighting of Lake Play Park – 6 p.m. Nighttime Electric Parade – 7 p.m. Details: Join us for a fun-filled night that the entire family can enjoy. The event which is open to all ages will feature holiday crafts, gingerbread house making contest, musical chairs and more! Refreshments will be served. Details: Bring the family downtown to frolic in Winter Haven’s very own winter wonderland. There will be 70 tons of snow making up the snow slide and snow pile for children and adults to enjoy. After the kids are done visiting Santa and Mrs. Claus, they can take a train ride, jump in the bounce house, and enjoy all the other activities that will be available. Details: Don’t miss the opportunity for free photos with Santa at Access Church (6-8), live music and holiday drinks at Concord Coffee (6-9), adult coloring at Art Centric Studio (7-9), a special Christmas raffle at A Kind Place (6-8:30), and special deals and desserts at Fat Maggie’s, all located in Dixieland (6-8:30). Details: Contact Polk State College for details on this event. Details: To celebrate the birth of the Savior, the ensembles and faculty from the Department of Music come together for two evenings of worship on a grand scale. Tickets are $5 for adults and $3 for students. You may purchase tickets at the door or online. Details: The FSC Music Department’s Christmas Gala has become an essential holiday music tradition for the college and greater community. This year’s edition, Home for the Holidays, offers a wonder-filled array of musical favorites performed by music department students and faculty, joined by special invited guests from FSC’s musical theatre program and the Florida Dance Theatre. Details: Polk State Music will present its annual holiday concerts, and just as audiences have come to expect, the repertoire will feature a mix of traditional favorites and a few surprises, too. Admission for the general public is $7. Details: Lakeland’s own professional dance company, the Florida Dance Theatre, brings its celebrated annual production of Tchaikovsky’s The Nutcracker to the stage of Branscomb Auditorium. Performed with charm and perfection by the dynamic dancers of FSC’s company-in-residence, this breathtaking production features colorful scenery, dazzling costumes, and entrancing choreography. As a special treat, community children join the professional dancers, creating a family-friendly, feel-good performance event. Details: The Imperial Symphony Orchestra welcomes the world-renown Canadian Brass to the stage to celebrate the sounds of the season with this Masterworks concert. December 11: 7:30 p.m.; December 12: 2:00 p.m. & 7:30 p.m.; December 13: 2:00 p.m. Details: HUMBUG! features a lively original score by Harnick & Legrand, high production values, evocative lighting, and video projections that bring the audience right into Dickens’s classic tale of redemption and eternal hope.This world premiere re-tells the beloved Christmas story with a tunefulness that highlights its humor, humanity, and heart-warming sentiment. Time: Dinner: 6:30 p.m.; Movie: 7:30 p.m. Details: The 1st Annual Thelma Kells Christmas Organ Concert with Guest Artists. Details: The ultimate holiday tradition for the youngest to the seniors in every family, seeing Moscow Ballet’s Great Russian Nutcracker creates holiday memories that last a lifetime. The renowned, award-winning principal dancers and corps de ballet thrill audiences with their expertise, dramatic expression and stunning leaps, drops and turns. Details: Decorations and holiday fun for kids of all ages while parents work on their shopping list during the Downtown Holiday Walkabout. Details: Bartow Ford and 97 Country have teamed together to create a FREE Winter Wonderland event featuring a 30 foot snow slide and snow play area, free photos with Santa, the Polar Express train, musical guests Elsa, Anna and Olaf, a bounce house, face painting, food from Uncle Mike’s Barbeque for purchase, and more. Details: Enjoy a traditional Christmas experience with Santa and Mrs. Claus. The event will include photos with Santa, hands-on holiday activities, and holiday storytime. Santa will also hand out books to the children. Details: Stir up the holiday spirit! Families are invited to a music lesson snippet with Kerry, followed by caroling together. Details: Local artist Catherine Price leads a workshop designing beautiful holiday décor using palm fronds to create “boondoggles.” $15/person. Supplies included. Reservations are required. Details: Enjoy an hour-long carillon concert with a live choir under the evening stars. Before or after the concert, visit Pinewood Estate for a special nighttime tour complete with hot chocolate and cookies. It’s a unique opportunity to visit the Gardens after normal operating hours. Enjoy a light dinner at the Blue Palmetto Café before the concert for an additional fee. Last entry to Pinewood Estate is at 9:30 p.m. Concert Only: $5/person; free for members. Concert & Home Tour: $13/person; $7 for members. Details: Bok Tower will distribute 1,000 time-specific tickets for the Holiday Home Tour on a first-come, first-served basis on Christmas day. Enjoy the café, gift shop, Holiday Home Tour, gardens and carillonneur Geert D’hollander. Regular Gardens admission rates still apply.